Red Bull is the perhaps the best known, and still most widely consumed energy drink in the world, the brand which started it all. Red Bull is a creation of Dietrich Mateschitz, an Austrian who adapted the energy drink from a Thai beverage called "Krating Daeng", a popular drink with rickshaw drivers in Thailand. Sold as an energy drink to combat mental and physical fatigue, it contains, per 250 ml serving, about 27 g of sugar (glucose, sucrose), 1000 mg of taurine, 600 mg of glucuronolactone, B-complex vitamins and 80 mg of caffeine. The caffeine in one serving is a little less than that found in an average cup of coffee (100 mg/8 oz. cup) or twice as much as found in a can of Coke (40 mg/12 oz. can). A sugar-free version has been available since the beginning of 2003. Almost 1 billion of the slim 250 ml cans were sold in 2000 in over 100 countries, 260 million of them in the UK. In 2003, almost 2 billion cans were sold in over 120 countries. 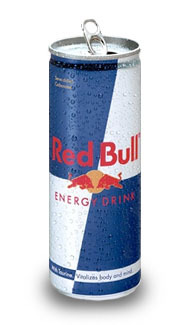 Slogan: Red Bull gives you wiiings!